See-through brains, shameful bullies and creativity in schools all made the news recently. 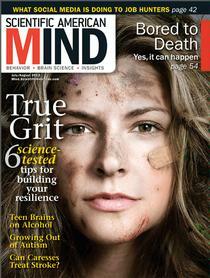 The Head Lines section of Scientific American Mind's July/August issue mentioned the following articles in brief. Click on the links to learn more about them. Bullies suffer for their actions. They tend to feel guilt, shame, anger and a sense of social disconnection. Creativity is often overlooked in schools. Only nine U.S. states include creativity as a criterion for gifted education. Rats who were tickled once a day for two weeks later responded less to stress. In a major advance, scientists created a see-through brain by replacing its lipids with a hydrogel. Neuroscientists have recorded videos of zebrafish brains in action. The technology detected 80 percent of their 100,000 neurons. Contrary to popular belief, many highly successful people are classic "givers"--they focus on helping others. We perceive the future as being closer to us than the past. If you are in a bad mood, eating either too much or too little can make you even crankier. An analysis of recent neuroscience studies rated their statistical power at a meager 21 percent, meaning results are more likely to be false than in most areas of biology. Scientists deciphered the shapes of two serotonin receptors, which could aid in designing new antidepressants. Conspiracy theorists tend to express feelings of powerlessness. Their theories may grant them a sense of control. Scientists have succeeded in a rudimentary form of mind reading. After extensive training, they could identify what a person was imagining while undergoing a brain scan. Losing sleep several nights in a row can lead to overeating and weight gain.